If you need a brand new, unlocked Samsung Galaxy S9 or S9+ in your life, you can currently take advantage of a few deals that are available in the US. While Samsung itself is offering a Gear S3 watch for just $99 (or a free pair of Gear IconX earbuds) with any of its Galaxy S9 smartphones, Best Buy today revealed a different offer. 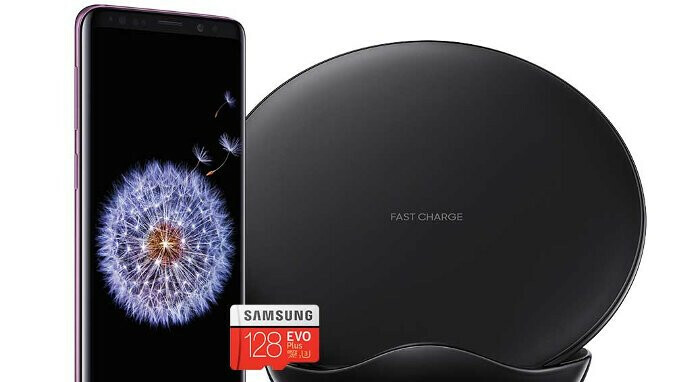 When purchasing an unlocked Galaxy S9 or Galaxy S9+ at Best Buy, you're receiving two free gifts: a Samsung EVO Plus 128 GB microSDXC UHS-I Memory Card (normally priced at $99.99), and a Samsung Fast Charge Wireless Charging Stand (normally priced at $69.99). The two accessories are automatically added to your cart if you're buying any unlocked S9, and there are no extra requirements to qualify for the deal. Best Buy is offering both the Galaxy S9 and S9+ in three color variants: Midnight Black, Lilac Purple, and Coral Blue. The phones' prices haven't changed since launch, so an S9 costs $719.99, while the larger S9+ is available for $839.99. These are official US variants of the handsets, thus being compatible with all relevant carriers. Best Buy lets you save an additional $50 on the unlocked S9 and S9+, but that's only if you activate the phones on Verizon Wireless (new line or new account required). You can find Best Buy's latest Galaxy S9 deals at the retailer's website via the source link below. P.S. : The recently announced Galaxy S9 128 GB and 256 GB are not available through Best Buy, being sold exclusively at Samsung. T-Mobile customers on the Military One plan can get it for 50% off ($360). $99 for the SD card and $70 for the charger would leave the buyer with about $200. I believe Verizon has it for 50% off. Not sure if Sprint and AT&T currently offer discounts on it.